"Jeff and I were really impressed with the way you and the rest of the office conduct business-professional, yet casual, and most of all efficiently." One of the biggest ski mountains in North America is better then ever! 141 trails make Steamboat the 2nd largest mountain in Colorado with 3,668 ft. vertical and 2,939 acres of terrain. Our primary mission "is to provide an opportunity for young athletes to become successful individuals and achieve their personal goals through participation in winter sports". That we have been successful in transmission of this achievement process is proven not only through our list of US Ski Team and Olympic Team members, but also through the thousands of SSWSC alumni who are now achievers and creators in all aspects of life. We have enjoyed being recognized as USSA Club of the Year 1999 and continue to earn the title of Ski Town USA. 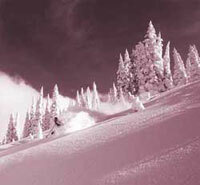 Steamboat Powder Cats provides a welcome alternative to the traditional ski resort experience. We offer untracked powder conditions, snow cat transportation and a full service environment that allow our guests to indulge in their powder skiing and snowboarding fantasies. Located just north of the Steamboat Ski Area in Steamboat Springs, Colorado, our exclusive U.S. Forest Service permit area receives over 600 inches of the lightest Champagne Powder in North America every year. Two luxury snow cats provide transportation for 24 guests per day in our 10,000 acre ski terrain. Our runs cater to guests of intermediate and expert ability, whether they seek the adrenaline charge of a steep tree run, or the serenity of a peaceful descent through one of our open bowls. What better way to spend the winter than cross country skiing on 30 kilometers of groomed trails winding through aspens and along beautiful Fish Creek! Our trails welcome all ability levels, novice to advanced, and are groomed for both classic, skate skiing and snowshoeing. Howelsen Hill Ski Area holds a unique place in the history of skiing. It has sent more skiers to international competition than any other area in North America. Howelsen boasts a remarkable heritage. It is the oldest ski area in continuous use in Colorado, and has the largest and most complete natural ski jumping complex in North America. Howelsen has been the training ground for 47 Olympians, 15 members of the Colorado Ski Hall of Fame & six members of the National Ski Hall of fame.